After the episode at Marrah, where the bitter springs were turned into drinkable water, Moses and the Israelites traveled to a place named Elim. It is described as having 70 palms (trees) and 12 wells, a fitting coincidence allowing one well for each of the 12 tribes of Israel. According to Exodus 15:23 and Numbers 33:9-10, the Israelites come to at Elim and camp “near the waters,” presumably referring to the Red Sea. Therefore, Elim should be near where the Israelites arrived after crossing the Red Sea, but to the north or south so they'd still be by the Red Sea. Elim must also be to the west of a mountainous area referred to as the "Wilderness of Sin," which the Israelites pass through on their way to Mount Sinai. And now removing from thence they came to Elim; which place looked well at a distance, for there was a grove of palm-trees; but when they came near to it, it appeared to be a bad place, for the palm-trees were no more than seventy; and they were ill-grown and creeping trees, by the want of water, for the country about was all parched, and no moisture sufficient to water them, and make them hopeful and useful, was derived to them from the fountains, which were in number twelve: they were rather a few moist places than springs, which not breaking out of the ground, nor running over, could not sufficiently water the trees. And when they dug into the sand, they met with no water; and if they took a few drops of it into their hands, they found it to be useless, on account of its mud. The trees were too weak to bear fruit, for want of being sufficiently cherished and enlivened by the water. 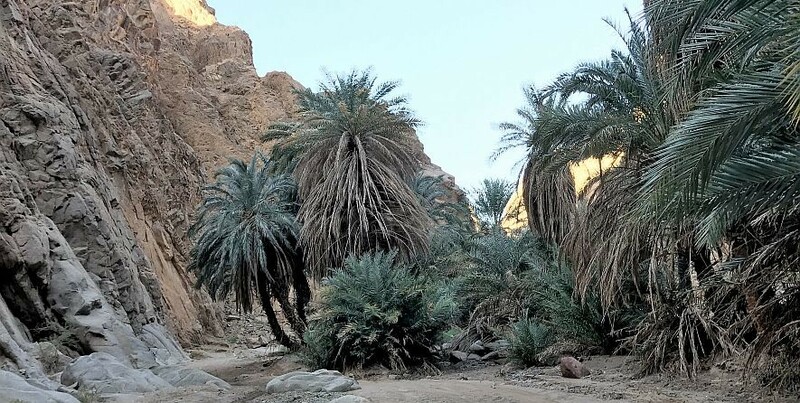 Both Josephus' and the Biblical description indicates it is a small area, as it only had 70 palms and 12 wells, with adequate campgrounds adjacent to the spot. The Hebrew root word of “Elim” (alternatively spelled “Elyim”) is “Eloth” or “Elath,” meaning a small group of trees, or a grove. If Saudi Arabia’s Jabal Maqla mountain is Mount Sinai, then this would mean that Elim is located near the northwestern coast of Saudi Arabia bordering the Gulf of Aqaba. The famous 1st century historian Josephus wrote that Elim could still be located during his time. He confirmed the existence of trees and wells at the location. About 6 miles from the Gulf of Aqaba, there is a small city within a valley named Tayyib Al Ism. It is widely referred to as the "Wells of Moses" and "Waters of Moses" by local Saudis. When our researchers visited the area, a couple of Saudis explicitly confirmed it as Elim when asked. Saudis from the eastern side of the country were visiting the area to see where they believed Moses walked. The possible crossing point from Egypt’s Nuweiba Beach into Saudi Arabia would have brought the Israelites into wadis (valleys) formed in a north-south direction. This possible match for Elim is located where three wadis meet; two north-south wadis and one east-west wadi. The topography explains why the Israelites would have walked in the direction described in Exodus. There is a collection of dozens of palm trees and, to this day, 12 wells, which are now reinforced with concrete. Proponents of this site as Elim argue that the 70 palms would have increased in number over time. If this is the correct location, then the Israelites traveled southwards from the Red Sea Crossing landing point using the north/south valley. Upon intersecting with the east-west valley, they'd reach Elim, drink from the 12 wells and camp nearby to the west by the waters within the east-west valley.